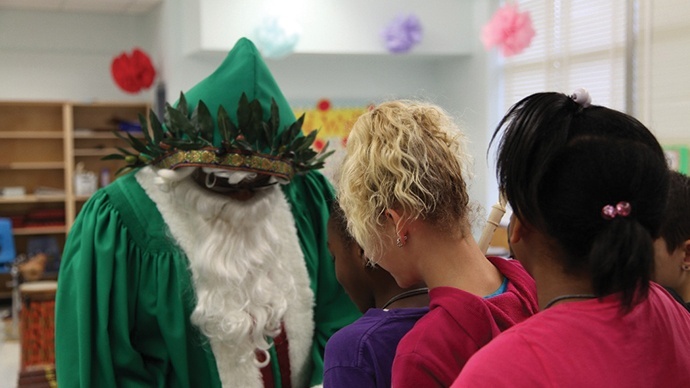 The holiday season is upon us and Regency Centers partnered with HandsOn Jacksonville to transform Love Grove Elementary, a Duval County elementary school, into a magical winter wonderland. Volunteers decked the halls with green tinsel and placed backpacks on the desk of each child at the school for them to discover the following morning. On Discovery Day, our little elves visited various classrooms and read the story of St. Nick to children and share messages of kindness and anonymous giving. 'A Visit from St. Nicholas' was a magnificent experience for the students, teachers and staff of Love Grove Elementary! Because we are a Title I school with a high population of students with varying exceptionalities and specific socio economic needs, this event was a magical and most appreciated opportunity by all. The excitement of the students resonated throughout our tinseled hallways and the hearts of our teachers and staff were filled with glee. A most memorable quote by one of our students as she opened her backpack filled with books and toys: 'This is everything I ever wanted for the Holidays'.